Insurers Take to The Sky. Drones Help Determine Value, Damage And Detect Fraud. During the last days of August, Hurricane Harvey hurtled with devastating force especially through the American state of Texas. Dozens of people died and about 500,000 families had to leave their homes. According to a first rough estimate, the hurricane caused damage to infrastructure, businesses, homes and other property of between $150 and $180 billion. Large insurance companies in Texas saw the storm approaching and quickly sent hundreds of damage experts to the area. A number of mobile claims centers were also deployed. The experts entered the area with the task of providing assistance and ensuring that the amount of insured damage was determined and paid out as quickly as possible. The number of claim incidents was huge and the area was poorly accessible and dangerous in many places. This meant that it could take a long time before a damage assessment took place and the first steps were taken to stop the damage. Such a delay means that consequential damage increases, individuals and businesses have to wait a long time for a pay out and it becomes increasingly difficult to determine the actual damage caused by the hurricane. This also results in the risk of fraud. Modern technology provides an answer. For the first time, the damage assessment process was helped on a large scale by deploying drones. From the sky, the damage to the entire area and to individual property was mapped. In the run-up to the storm, drone supplier Kespry gave hundreds of experts a brief training in using drones. According to insurance company Farmers, one of Texas’ largest property insurers, an expert can assess three properties per hour using a drone. Without a drone, this would be up to 3 per day! A drone can quickly collect a large amount of footage of the affected property and its surroundings. In addition, photos can also be taken of places that are dangerous and difficult to access, such as roofs. These photos and the special assessment software help the experts to quickly arrive at the most accurate cost tag. The disaster caused by Harvey was the first time drones were deployed on such a large scale. According to supplier Kespry, the event was also a big field test of various devices, which will lead to dropouts and technical improvements. The aftermath of Hurricane Harvey is a bitter but illustrative example of the options provided by the deployment of drones. For many people, the small planes are still toys and especially fun for taking beautiful aerial photos, but the number of serious applications is increasing rapidly as is the number of companies that offer these applications. From inspecting hard-to-access technical installations (for example, wind turbines), to recording stocks over large areas, to helping extinguish large fires or collecting seismic information in hazardous places. Unmanned airplanes enable accurate information to be collected very quickly and safely, and this is then analyzed with specialist software for the intended purpose. For insurers, speed in determining damage is important but this must also be done with care. The automated assessment of photos and the claim description of the insured party significantly increases this speed. Additionally, fraud indicators are automatically signaled. Ultimately, this will especially help honest insured parties. The damage will be paid out faster and more accurately. Of course, this also benefits the insurer: quick assessments result in less consequential damage and less opportunity for fraud. The use of drones to gather information about damage to buildings or installations is on the rise. In the past few years, several US companies have been granted permission from federal aviation authorities to carry out inspections of all types of damage using unmanned small planes: from hail damage to collapsed roofs and from burned down businesses to areas affected by flooding. It is not only with respect to claims handling that drones are currently proving their value, but also when offering insurance. A drone can assess the property to be insured quickly and accurately. This gives the insurer a quicker picture of the risk and allows it to determine the premium more adequately. They also help when taking preventive measures. 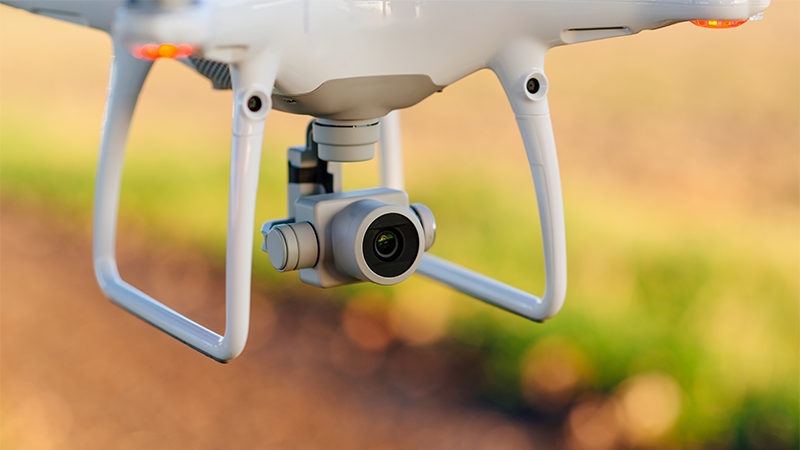 Using a drone to look closely at a building from all sides allows, for example, areas that are not burglar-proof or overdue maintenance to be detected. Although they are currently only deployed on a small scale, the value of drones to the insurer and its customers is already considerable. The use of drones can make the acceptance and claims handling process for certain property faster, more precise and safer and can help to detect possible fraud.